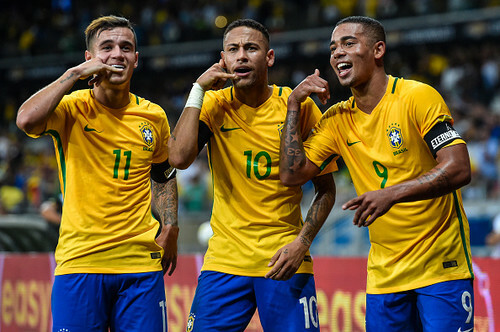 Brazil are the bookies’ favourites to win this year’s World Cup so here we take a look at the squad that may secure them the title. Manchester City’s goalkeeper Ederson is the world’s most expensive keeper but has had just one cap for Brazil. His rise in the sport was slightly unusual, having never played a professional game in Brazil before he was signed by Benfica when he was just 15. He moved to City last year where he was an important part of their title winning squad. While he may not be first choice, he is certainly a very useful backup. Corinthians’ Cassio has also had just one cap for Brazil. The 31-year-old was relatively unknown before he returned to Brazil in 2012 but he quickly made headlines winning the Golden Ball in Corinthians Club World Cup win over Chelsea that year. He had a poor year in 2016 but got back on track in 2017 and is also determined to have a chance to shine at this World Cup. Paris Saint-Germain’s Thiago Silva has had 70 caps for Brazil at 33 years old. He is a huge personality, but considered quite fragile. He started crying before the last-16 penalty shootout against Chile four years ago and was then replaced by Neymar as team captain. The decision left him “annoyed” but many critics claim that he has a personality problem. Nonetheless, he is a quality and experienced defender who is sure to play an important role. Gremio’s Pedro Geromel has had just 2 caps for Brazil at 32 years old and many were surprised at his inclusion in the squad. He has played with various teams in Portugal and Germany over the years before returning to Brazil where he has flourished at Geromel. He had his Brazil debut in January this year and will certainly be looking to make in impact in what will probably be his only World Cup. Real Madrid’s Marcelo has had 53 caps for Brazil at 30 years old. He is an incredible talent, as shown by his performances in the Champions League last season, particularly against Bayern Munich. Following the disappointment of 2014, when Brazil lost 7 – 1 to Germany, and he scored an own goal, he is coming to Russia determined to make amends. Corinthians’ 29-year-old Fagner probably only has a place in the squad due to Dani Alves being ruled out. He has had 4 previous caps for Brazil and is a star player at Corinthians. This will be his first World Cup and he was very publicly delighted to be included in the squad. He is certainly a formidable defender and is sure to work hard to justify his inclusion. Manchester City’s Danilo has had 17 caps for Brazil. City paid £26.5 million for him to Real Madrid, a fee that shows just how good he is. Danilo is comfortable as both a full-back and a holding midfielder, a useful quality in a 23-man squad. He has had injury problems in his past, seriously damaging his knee in a 2012 game while playing for Porto. However, he made a full recovery and he is likely to make an impact in Russia. Atletico Madrid’s Filipe Luis has had 32 caps for his county. While he fractured his leg in March, he was determined to be included in the squad after missing the 2010 World Cup. He is a highly experienced player, having appeared in over 300 games for Atletico Madrid, and this experience is sure to be a valuable asset to the team. Real Madrid’s Casemiro has had 23 caps for his country. Real sent him on loan to Porto in 2014 and some felt that his potential was never going to be fulfilled with critics claiming that he was more focused on enjoying the nightlife than playing football. However, at Porto, and then back at Real, he began to flourish and he has been widely praised in recent years. Barcelona’s Paulinho has had 49 caps for his country and he is just 29 years old. Despite his relative youth, his career has not been straightforward with many claiming it was virtually over when he moved to China from Spurs in 2015. However, Barcelona brought him back to Europe where he eventually settled in after a slightly dodgy start and he should arrive in Russia feeling confident after the past few months. Muito feliz por representar o meu país em uma Copa do Mundo! ?????????? Renato Augusto has had 28 caps for Brazil. He has been in China since 2016 and before that, he was playing at Corinthians. It was at Corinthians where he was developed into an excellent box-to-box midfielder and this has allowed him to become a key component of the national team. Despite this, he will have to work hard for his starting place as there is plenty of competition. Barcelona’s Philippe Coutinho has had 36 caps for Brazil and scored 9 goals. His recent move to Barcelona disappointed many Liverpool fans but Brazil coach Tite has heaped praise upon him, “That magic, that capacity to invent and create something, that change of rhythm, the way he builds play, it’s crucial for any side.” He is sure to be one of the most important players for the team in Russia. Shakhtar Donetsk’s Fred was banned for a year in 2015 after failing a drug test, but he always denied using drugs and his career is back on track. He has had 8 caps for Brazil and is due to move to Manchester United next year. When he was first called back to the Brazil squad he thought it was a joke, but now that he is there he has promised to work hard for the team. Chelsea’s Willian has had a massive 56 caps for Brazil, but when Tite took over in 2016 he initially lost his position to Coutinho. However, Tite soon started to investigate ways of having both of them on the team and thanks to this Willian is now a key part of the squad. Willian has been full of praise for Tite’s coaching techniques and he is sure to make an impact in Russia. Paris Saint-Germain’s Neymar is regularly making headlines. At just 26 years old he has had 84 caps for Brazil and has 54 goals to date. If he keeps up his current rate he should pass Pele’s Brazil scoring record, but there is going to be a huge amount of pressure on him in Russia. He has managed to recover from a recent injury and has dismissed all transfer speculation in recent weeks saying his only focus is the World Cup. Manchester City’s Gabriel Jesus has had an impressive 16 caps at 21-years-old. His rags to riches story has captivated fans and he regularly claims that his success is purely down to his mother. He is known to get on well with Neymar and says that his favourite player is the retired Brazilian player Ronaldo, The Phenomenon. Liverpool’s Firmino has had 20 caps for Brazil and scored 6 goals. He joined Liverpool from Hoffenheim for £29 million in 2015 and he has earned a great deal of praise while playing at Anfield. He grew up determined to be a football player, sleeping with his football from the age of six, and was helped along the way by a local dentist who spotted his talent and started working as his agent. Many were surprised at the inclusion of Shakhtar Donetsk’s Taison in the squad. He has had 7 previous caps, and scored once for the team, but in general people feel he hasn’t lived up to early promise. However, Tite says that he has shown “consistency and mental strength” and that he “brings versatility” to the team. Douglas Costa has had 24 caps for Brazil and scored three goals. Currently on loan to Juventus from Bayern Munich, he has been impressing after suffering from numerous injuries over the last decade. Tite has praised him saying that he can play “right, left, sometimes inside”, something that he believes is a great help to the team.